Raja Sen was most thrilled about catching Jerry Seinfeld in India this weekend, but the performance has, it appears, been scrapped. For the most preposterous reasons. Here, then, is a script of Jerry and the gang dealing with the news. Kramer is staring suspiciously at something resembling a vada-pao. George is walking around, sweating profusely. Jerry is sitting by the phone wearing red tankpants and a blue t-shirt. Elaine enters. She's trying to carry in three massive suitcases. It takes her time to enter as she drags them in while the men look at her curiously but not moving to help her. Finally, after falling over a couple of times, she gets them all in. Then she turns and glares at the boys. ELAINE: Okay, I'm ready. I can't believe you talked me into this. But here's everything. ELAINE (CONTINUED): (Looking at George) And you! You couldn't give me a ride? Where are your bags? GEORGE (SULLEN): I don't have any. Kramer has meanwhile walked up to Elaine and is trying to show her his vada-pao. Elaine hears George and shoves Kramer in instant reaction. Kramer falls backwards onto the kitchen counter, bangs his head, walks into the fridge. JERRY: That's what I'm saying, Lainey. We aren't going anymore. GEORGE: Because they don't have enough parking spaces. Elaine walks up to George menacingly and grabs him by the collar, gnashing her teeth. ELAINE: I'm warning you, Costanza. I'm not in the mood. GEORGE: No, no, I'm serious. They don't have place for us to park. JERRY: It's what they said. ELAINE (Stunned): Really? But we're in New York. Nobody parks here. JERRY: I told them to ask the audience to take the bus. 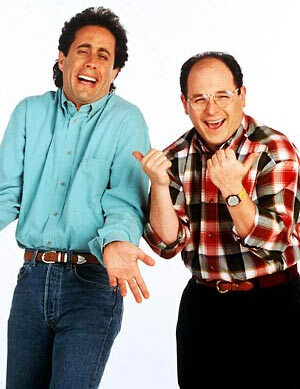 GEORGE: I told you, Jerry. I told you that India's getting weirder by the day. KRAMER (getting to his feet): No Jerry, it's a nuthouse! They're banning everything out there. Their 50 Shades Of Gray is shorter than our preview for 50 Shades Of Gray! GEORGE: And they want to jail comedians. Can you imagine the four of us in jail? Again? JERRY: But I'm a clean comic! ELAINE: No Parking? Really? I don't buy it, Jerry. 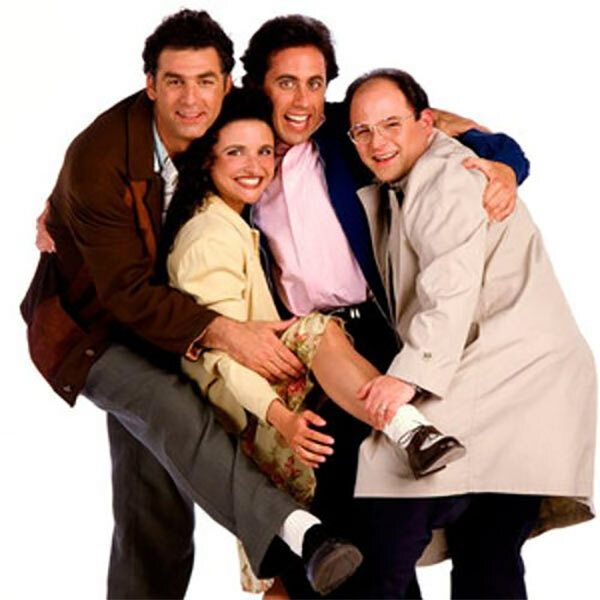 Kramer plonks himself between Jerry and Elaine and pulls them close. KRAMER: Oh, it's all a giant conspiracy. You know the policemen in Bombay? GEORGE (Leaning forward, intrigued despite himself): Yeah? KRAMER (Whispers): They're all pig-men. KRAMER: I'm telling you, Jerry. They are! Bob Sacamano went there a couple of years ago and one of them was oinking around closing down bars and parties, nostrils flaring. Pig-men! GEORGE: Anyway. (Rolls eyes at Kramer incredulously, turns to the others) I don't buy the parking thing either. ELAINE: Maybe they couldn't arrange my security detail. JERRY: Oh, you aren't important on our show. Here you're just hunting for an apartment. Elaine grumbles. Jerry shrugs. George looks at Kramer while Kramer raises his nose up to make it look like a snout. GEORGE: I could have coffee. There's a sensational new waitress at the diner. ELAINE (Perking up): Oh, I want a big salad. The other three groan in unison. KRAMER (cuts him off): Maybe they just couldn't sell tickets. ELAINE: That could totally be it. Jerry pauses in the doorway, his shoulders suddenly slumped. GEORGE (Tapping the side of his head like Obelix): These Indians are crazy. Your FAVE Aamir Khan Movie? VOTE!